For many years this group of species was considered to be part of Aphis. Then somewhere along the way we started using the subgenus name Protaphis for similar Aphis that often live on lower stems and roots of various plants. Recently, we have started using the name Protaphis as a separate genus, apparently due to some DNA sequence evidence that the group is distinct from Aphis evolutionarily. Now, Blackman & Eastop note that there are about 50 nominal species in the group, and many are not clearly distinct from the others. In North America, I have generally applied the name Protaphis middletonii (Thomas) to almost all of my samples. Interestingly, the two samples I have of sexuales of Protaphis were both found on the aerial parts (one on Tragapogon, the other on Conyza, both Asteraceae). This name now applies to a wide range of Protaphis found mostly on roots and stems of various herbaceous plants, but sometimes it is also found aerial parts of plants and on shrubs. For many years taxonomists tried to split this taxon into several species, but a decision was made some years ago to lump them until better information is developed regarding how many species there are, and what to call them. I applaud that kind of lumping. As you’ll see from my collection database, I have this species from a lot of hosts. These specimens show a lot of morphological variation. 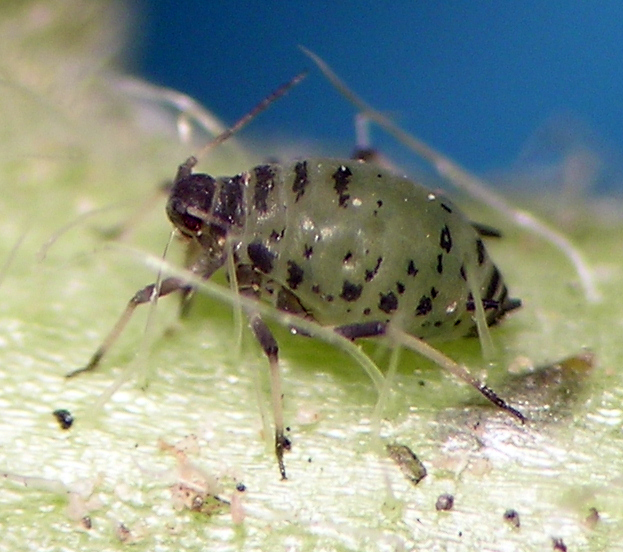 This aphid is one of the easiest to find in most agricultural settings — simply pull up a few mustard weeds and it is likely present next to almost every field. Protaphis middletonii from central Washington in July. Protaphis middletonii alate vivipara having just colonized the foliage of a tumble mustard weed.